Global metals and mining companies are increasingly moving towards cloud-based data storage to complement mobile devices that provide employees with instantaneous access to that data. The Internet of Things (IoT) is the digital ribbon that ties together key operational and business data to improve real-time access and decisions that can increase efficiency and therefore profitability. • Connected Asset Management to maximize asset output and minimize downtime. • Connected Operations to improve business process management. • Connected Logistics to track and manage vehicles by reducing downtime and saving on fuel and maintenance costs. • Remote Service Management to predict maintenance requirements two to three months faster than before. Koch also believes that metals companies would not necessarily have to produce their own products but could manage the production chain through IoT by using other companies’ production assets. “Much in the same way that Uber doesn’t own any vehicles and Airbnb doesn’t own any hotel rooms, you can have a metals company that sells its own brand of material but lets others handle the production by managing the process through the connectivity of IoT,” Koch said. But despite the advantages of connectivity through IoT, there are barriers to entry. Some of those barriers are monetary. “The current environment in metals is not great with fairly low utilization rates. Producers are being prudent with capital expenditures. Being prudent is understandable, but if a company is not looking to adopt IoT technology, it could be on the outside looking in,” PwC’s Tomera said. Want to hear more about IoT and Digital Transformation in Metals? Join the webinar December 6th. 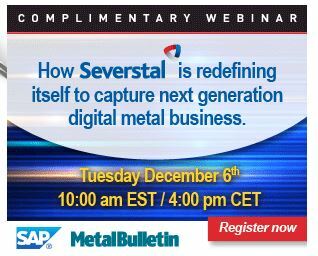 Hear from CIO, Yuri Shekhovstov how Severstal is redefining itself to capture the next generation metals business.